The quadrennial U.S. presidential nominating conventions are usually dominated by domestic themes. But they have at times been flavored by global economic concerns and national security threats, offering competing Democratic and Republican visions about the United States' role in the world. Republicans and nominee William McKinley, meeting in St. Louis, Missouri, campaign to protect U.S. manufacturers by raising the tariff on foreign imports. They also express opposition to "the free coinage of silver, except by international agreement," in favor of maintaining the gold standard. 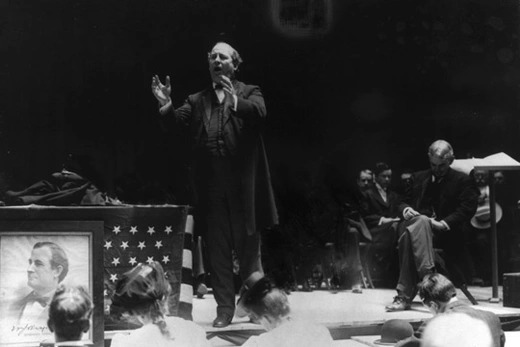 Meanwhile, Democrats and candidate William Jennings Bryan, in the party platform rolled out in Chicago, denounce Republican attempts to restore a 50 percent tariff for many goods under the Tariff Act of 1890 sponsored by McKinley while in Congress, which they say "proved a prolific breeder of trusts and monopolies." But Democrats are split along regional lines on the silver issue. Prior to winning the nomination, Bryan gives a rousing convention speech arguing in favor of silver, ending with the following lines: "You shall not press down upon the brow of labor this crown of thorns; you shall not crucify mankind upon a cross of gold." The final platform argues for the return of the coinage of silver without need for international consent, calling "gold monometallism" a British policy that threatens U.S. sovereignty. 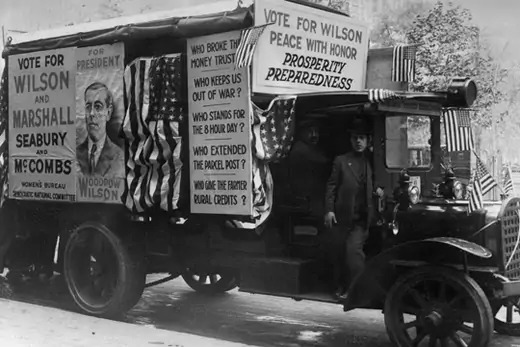 With Europe at war for two years, the Democratic Party and incumbent President Woodrow Wilson meet in St. Louis, Missouri, and campaign on a platform of neutrality and determination to keep the United States out of the war. This becomes a central theme of the convention. However, the platform also calls for military preparedness and notes the "revealed necessities of international action which no former generation can have foreseen." In Chicago, Republicans and candidate Charles Evans Hughes, in their platform, also campaign for neutrality but call for presidential diplomatic powers to be handed to Congress, and an immediate halt to military spending increases. They also declare that "no war shall be declared or waged by the United States without a referendum vote of the entire people," except in case of invasion. 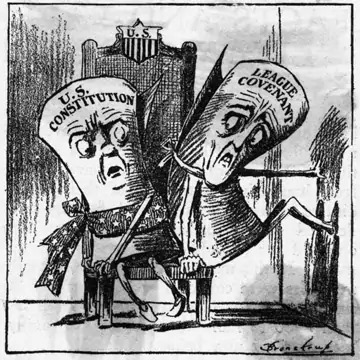 In the aftermath of World War I and with an increasingly isolationist American public, the Republican Party and its nominee, Warren G. Harding, meeting in Chicago, run on a platform criticizing the incumbent Democratic administration's handling of the war and noting the nation's "unpreparedness for peace." The platform spurns joining the League of Nations, created at the Paris Peace Conference that ended World War I in 1919. "It will avail nothing to discuss in detail the League Covenant, which was conceived for world super-government, negotiated in misunderstanding, and intolerantly urged and demanded by its administration sponsors, who resisted every effort to safeguard America, and who finally rejected it when such safeguards were inserted," Harding says in his convention speech. Democrats and their nominee James Cox, convening in San Francisco, campaign in favor of the league, saying it is the "surest, if not the only, practicable means of maintaining the permanent peace of the world." 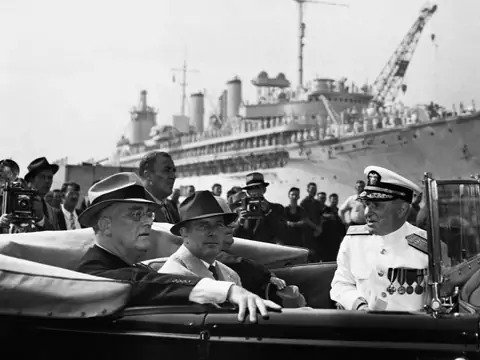 With a war again raging in Europe, the Democratic Party and incumbent President Franklin D. Roosevelt, meeting in Chicago, run on a platform to significantly strengthen the U.S. military in anticipation of an attack and to extend to European allies "all the material aid at our command." But the platform says the United States would not participate militarily in the war "except in case of attack." Republicans and their nominee Wendell Wilkie run on a platform "firmly opposed to involving this Nation in foreign war," but also call for greater military preparedness. The Republicans, convening in Philadelphia, blame Roosevelt's New Deal economic policies for "our un-preparedness and for the consequent danger of involvement in war." 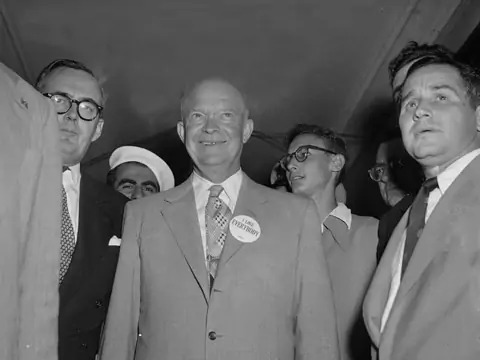 Republicans and their candidate Dwight Eisenhower, in Chicago, campaign on a platform to end the two-year-old Korean War. They also attack the Truman administration for failing to halt Soviet Communism, saying, "500 million non-Russian people of fifteen different countries have been absorbed." At the convention, though Eisenhower makes no mention of communism in his speech, Republican Senator Joseph McCarthy takes to the podium, railing against the communist threat at home and abroad. "[W]e have allowed Communism to spread its dark shadow over half of Europe, and almost all of Asia, and for the first time, for the first time they are appearing on the pages of America's history," McCarthy says. Also meeting in Chicago, the Democratic Party and its nominee Adlai Stevenson defend the U.S. effort in Korea as showing resistance to the "menace of Soviet aggression." 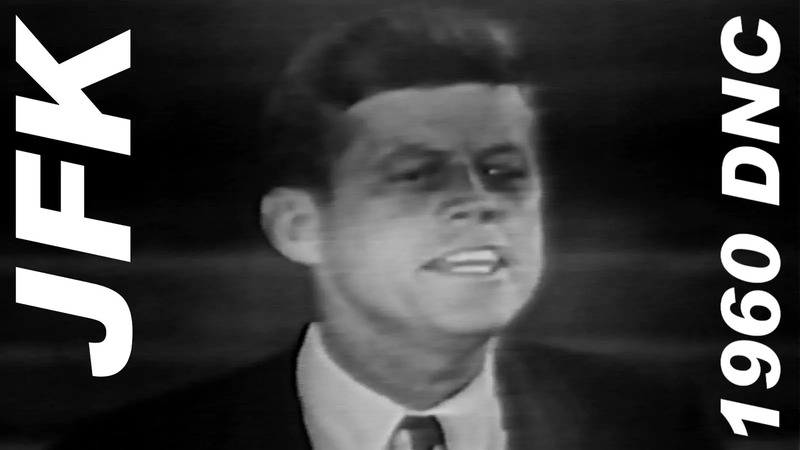 The Democrats, along with nominee John F. Kennedy, launch a platform in Los Angeles that includes pointed references to the takeover of Cuba by Communist leader Fidel Castro, who came to power in 1959. The platform pledges to prevent "the establishment of a regime dominated by international, atheistic Communism in the Western Hemisphere." They also assert the country has a "missile gap, space gap, limited-war gap" with the Soviet Union. The Republican Party and nominee Richard Nixon, meeting in Chicago, also campaign on a strong national security platform, but make no mention of Cuba. Both party platforms include a pledge to move forward on nuclear disarmament. Against a backdrop of raucous anti-Vietnam War protests and a sharp police crackdown in Chicago, the Democratic Party and candidate Hubert Humphrey craft a platform that rejects "as unacceptable a unilateral withdrawal" of U.S. forces from Vietnam. But the party is split on the issue, with a minority plank championed by rival candidate Senator Eugene McCarthy (D-MN) calling for both ending bombing in North Vietnam and a negotiated withdrawal. The widely covered protests on the sidelines of the convention were directed at the escalation of the war by the Johnson administration. Republicans and nominee Richard Nixon, convening in a quieter Miami Beach, pledge to find an "honorable end" to the war. 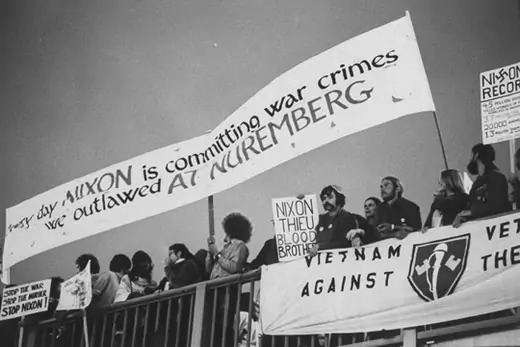 Meeting in Miami Beach, Republicans and incumbent Richard Nixon tout a drawdown of forces in the Vietnam War, but the convention is plagued by widespread anti-war protests. The Republican platform also hails Nixon's decisions to impose mandatory price controls and take the dollar off the gold standard to try to mitigate inflation caused in part by war spending. The Republicans say the policies have helped make "the difficult transition from inflation toward price stability and from war toward peace." 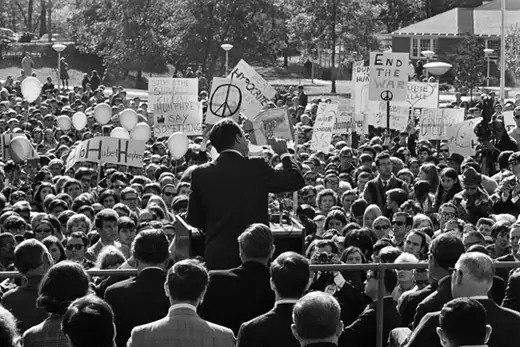 In New York, the Democratic Party and its candidate Senator George McGovern (D-SD) note in their platform that, while troop reductions have occurred, "the war has been extended in Laos and Cambodia; the bombing of North Vietnam has been expanded to levels of destruction undreamed of four years ago." They also say Nixon's economic policy "has deliberately driven people out of work in a heartless and ineffective effort to deal with inflation." In his convention speech, McGovern offers to end the "senseless bombing of Indochina on Inaugural Day" and "put millions back to work." 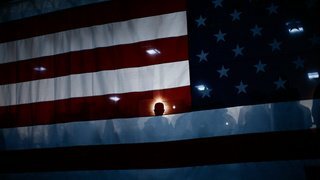 The election opens as the nation copes with an ongoing hostage crisis in Iran and the aftermath of the Soviet invasion of Afghanistan, launched the previous December. Incumbent President Jimmy Carter faces a lengthy convention fight in New York as Senator Edward Kennedy (D-MA) forces him to add a number of liberal domestic and economic issues to the platform. On foreign policy, the platform emphasizes diplomacy and peace in the Middle East. It touted the Carter administration's boycott of the 1980 Moscow Summer Olympic Games and trade restrictions as showing "determined opposition to Soviet aggression" in Afghanistan. Republicans and their nominee Ronald Reagan, gathering in Detroit, launch a platform heavily focused on national security and the U.S.-Soviet relationship, saying "the United States can only negotiate with the Soviet Union from a position of unquestioned principle and unquestioned strength." In Houston, the Republican Party and incumbent George H.W. Bush come out in support of the North American Free Trade agreement, saying it will produce economic incentives to reduce illegal immigration from Mexico. 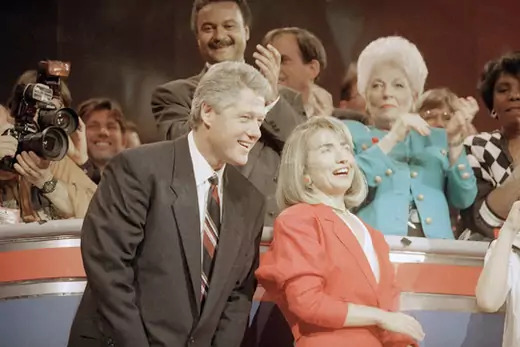 In New York, the Democratic Party and nominee Bill Clinton say they would insist "that the conduct of world trade is fair" and "legitimate concerns about environmental, health and safety, and labor standards are included" in any trade deal. Third-party candidate Ross Perot does not hold a national convention, but makes trade a central theme of his campaign. "You implement that NAFTA, the Mexican trade agreement, where they pay people a dollar an hour, have no health care, no retirement, no pollution controls," Perot says in a presidential debate. "And you're going to hear a giant sucking sound of jobs being pulled out of this country." Following the 9/11 attacks on the Pentagon and World Trade Center, the United States invades Afghanistan and Iraq, provoked by terrorism and national security concerns. National security issues permeate the 2004 campaign. Republicans and incumbent President George W. Bush say in numerous convention speeches and in their platform, released at the party gathering in New York, that they are dedicated to ensuring "America remains safe, terrorists are defeated, and democracy flourishes in the world." 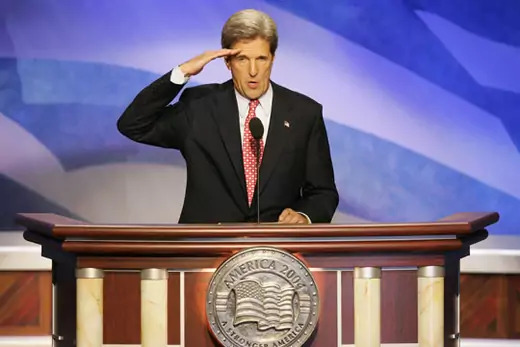 In Boston, the Democratic Party and nominee Senator John Kerry (D-MA) also run largely on national security issues. The party releases a platform criticizing the Bush administration's approach to world affairs, accusing it of a "rush to force before exhausting diplomacy." The country continues to face two increasingly unpopular wars. 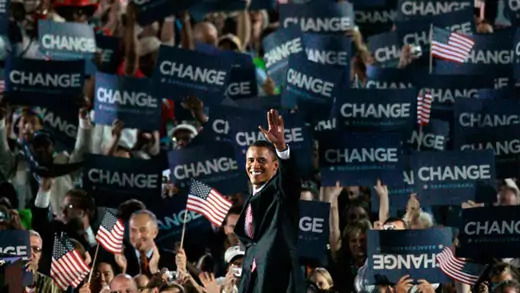 In their 2008 platform, Democrats and nominee Senator Barack Obama (D-IL) pledge to bring the Iraq war to a close and "defeat al-Qaeda in Afghanistan and Pakistan, where those who actually attacked us on 9/11 reside and are resurgent." The platform also promises to increase troops in Afghanistan and focus on the Pakistan border region as well as calling for the increased use of technology, such as satellites and drones. The Republican Party and its candidate, Senator John McCain (R-AZ), also run on a platform focused on national security, rejecting "politically inspired timetables" for Iraq and "the Democratic Party's idea that America can succeed in Afghanistan only by failure in Iraq."